Well- I was curious, so here's my first salvo at the 100 yard range with Nosler Partions 160gr. (Took one fouling shot in the backstop). Mmmkay.. Every bit as good as my 140 Sierra GK 140's. And these 160 gr partitions are from factory Federal Premium!!. So I went over the 300-400 yard range and set up. Really bad timing for this side of the range- it faces due East, the sky was blue, no clouds, the sun was high at 11:30a.m. and the wind was blowing from the south / southwest at 20mph. 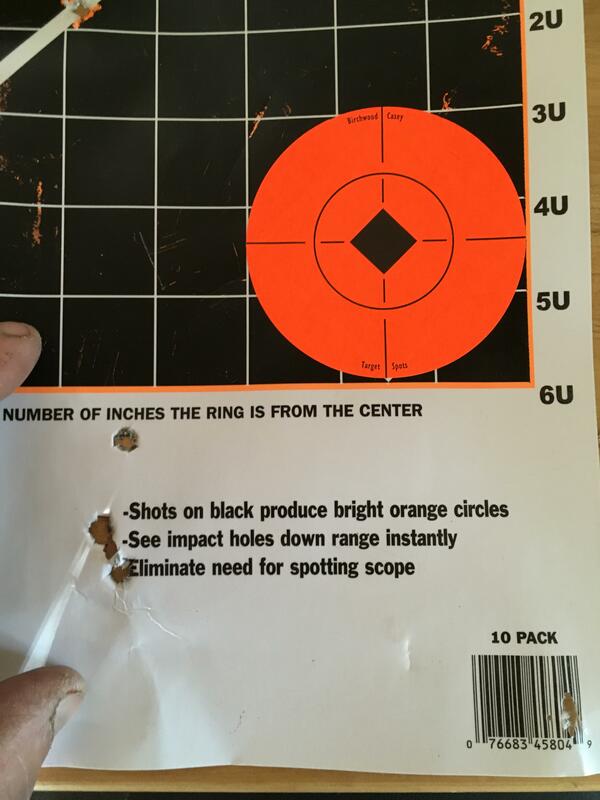 At 300 yards my factory Federal 160gr partitions grouped well enough but I had a few flyers. I really chock that up to to the blinding sun- I could literally only scope the orange dot for 5-6 seconds before the sun glared my vision out. However the best group was my 140gr. Sierra GK handloads. I did not adjust the scope for the shot. The target was 300yds. I held on the bullseye and fired 3 rounds. That's not bad. Some minor scope adjustments and fine tuning that round and I'll be pleased with it. So with this target the wind was blowing from left to right. With that strong of a wind I did NOT hold for windage. So I won't know my long range zero until I get a windless day. The scope I have is a windplex Leupold, CDS dial. So once I settle in on two loads and zero them where I want them at 200 then I'll order the custom dials. Then I can use the windplex hash reticles to account for wind drift. Well, enough shooting targets with that gun, go hunting already - you have plenty of accuracy, more than you can really use, still get as close as you can, anyway. I mentioned that this month's American Rifleman has an article on the X-Bolt, and in that article the A-Bolt is mentioned. The A-Bolt has a "bolt roller" under the bolt, it needs to be oiled occasionally, in the X-Bolt they avoided needing a bolt roller. But anybody reading this that has an A-Bolt, check out your roller and oil it occasionally. Yeah I just ordered my CDS dial based on the factory Federal data, so hopefully I get it before I leave in 2 weeks. 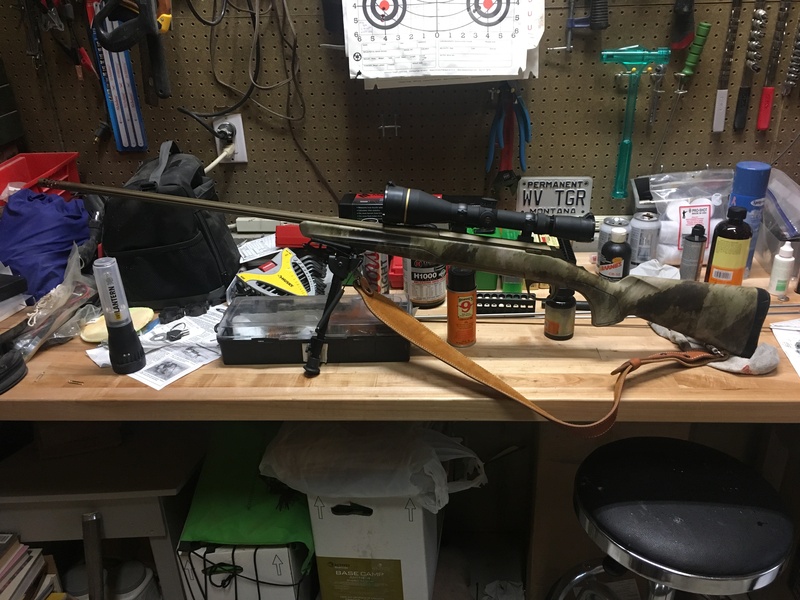 The nice thing with this group from Federal- I can use that round as the parent for working up handloads with the 160Nosler partition, using the Federal distance to lands as a starting point, and loading powder working up to Federals rated muzzle velocity. Makes it A LOT easier. I bought a magnetospeed bayonet style chrony last week. My handloads using H1000 70grs zips that 160grain Nosler out at 3,100 fps. Velocity is pretty consistent- max spread was 25fps, standard deviation 9. I've noticed that this rifle likes a little jump to the lands- no closer than .025. I went to the range Sunday- it was 30 degrees, snowing, with sustained winds of 35mph and gusts to 50mph. I still managed .75 - .50 groups at 100yards. We've got snotty weather coming in- going elk hunting later this week, then next week to the Canadian border chasing muley's..
You’re living on the edge. That load is 4 grains over max. I found one of my 5 reloading manuals that said ‘nah- 70 is ahright’, lol. The Hodgdon data is generally on the conservative side. It's hard to argue with success like you're having. Well success on paper didn't translate to a big mulie this year. Went out for a week, just got back last night. Only saw one shooter buck, and he was hot tailing a couple does 2 coulee ridges over. 500 yards- no shot taken. I called in A LOT of smaller bucks though. That was fun. We noticed a lot of ground (BLM) was grazed down to nothing. It was tough finding a few herds in NE MT around the border.